WHO do you look to for advice? Are they living their lives in full bloom? If not, consider seeking out the flowers, family and friends who are blooming boldly and brightly…for they have established deep roots, pushed up through the dirt, and are ready to pass on their seeds of wisdom to you. Mary in The Secret Garden was surrounded by a list of characters like Dickon who were offering up sage advice and guidance to her as she navigated her new world at Misselthwaite Manor. I am too am blessed. Throughout my life, I have been flanked by an ever changing group of women and men of all ages who have knowingly and unknowingly spoken into me, teaching me grace and honesty, all while modeling a life lived in full bloom. A few years back, my friends and I were out having a rare girls dinner when bumped into a group of my mothers’ lifelong friends. These lovely ladies are my mother’s tribe, her supper club, her prayer warriors, and for me growing up…they were my second set of mothers. As we giggled at our table, a few of them strolled over…immediately connecting with us because we, in essence, were reflections of them…just a little younger and a bit rundown from driving carpool and chasing kids around all day. We are all friends who tell the truth, share our secrets and hard earned lessons for living better, making us all better together. At some point my friend Katie asked thesm if they had any advice for us…as the next generation of them. We all laughed that night, considering this advice only a beauty secret. But as I type them now, her words have an even deeper meaning, far below the surface that a good lotion with SPF provides. Walking through this life, with the harsh winds and the heat of living and loving, can leave us mentally and physically parched. Having friends who can give you water for your soul is important enough to repeat three times: moisturize, moisturize, moisturize. Find friends who will pick up your dry bones and breathe life back into them…when you just can’t. Frances also wrote in The Secret Garden about this very thing…about how a perfect garden…just wouldn’t feel right. Just like it wouldn’t seem like YOU if you nipped it, tucked it, filled it, and sucked it in too much. There is something to the natural ways of things…so just be you…real and imperfect, and RELAX. ARE YOU A BLOOMING FLOWER? Then take some time this week to intentionally sow some seeds of wisdom into those around you. It doesn’t take much. A quick text, a word of encouragement, and even a bright smile can make a big difference in someone’s world. 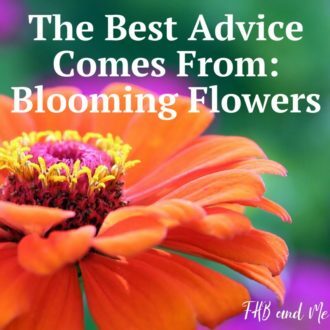 What advice have you learned from the blooming flowers around you? Comment below.